Vučić now seems free to push through an ambitious agenda of economic liberalization, including a new bankruptcy law, a looser labor law, an anti-corruption push and accelerated privatization of state industries — with the goal of unleashing a stronger Serbian economy as well as bringing Serbia’s laws and economic policy closer in line with mainstream EU policy. Although the Progressives will control an absolute majority in the Serbian parliament, Vučić may yet try to bring one or more of the decimated opposition parties into a wider, reform-minded coalition. 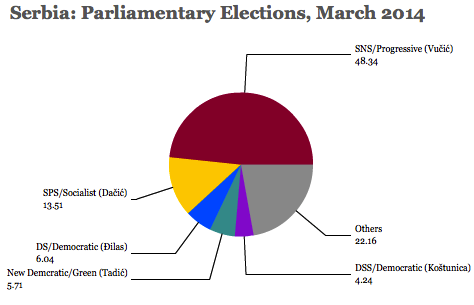 Serbia’s electoral earthquake also shook two longstanding political parties out of the Serbian parliament altogether. The nationalist, conservative Democratic Party of Serbia (DSS, Демократска странка Србије) failed to achieve the 5% electoral threshold, and it will lose all 22 of its previous seats in the National Assembly — the only time since the party’s foundation in 1992 that it failed to do so (except for its boycott of the 1997 election). Despite its conservatism, its leader Vojislav Koštunica served as Yugoslavia’s president between 2000 and 2003 (immediately succeeding Slobodan Milošević) and as Serbia’s prime minister from 2004 to 2008 in alliance with Tadić’s Democrats. The United Regions of Serbia (URS, Уједињени региони Србије), another center-right, regionalist party, won just 3% on Sunday — though it initially supported the SNS/SPS government, it joined the opposition in September of last year. Previous PostTo ы or not to ы, Zhirinivosky asks — as Kazakhstan, central Asia worryNext PostWho is Aleksandar Vučić? Serbia’s next prime minister.